Anyone who has done just a smidgen of renovations knows how easy it is to have “project creep” – one thing here leads to something over there – and on it goes. This whole renovation has been one of those – remember this started out to be a simple change of kitchen linoleum – but that was four years ago…. We’re trying to remodel a closet – but, now we’re stuck at the front door? So, we have the front sheathed and you can see the waterproofing membrane placed against the rim joists before the concrete was poured to keep the wood from rotting. 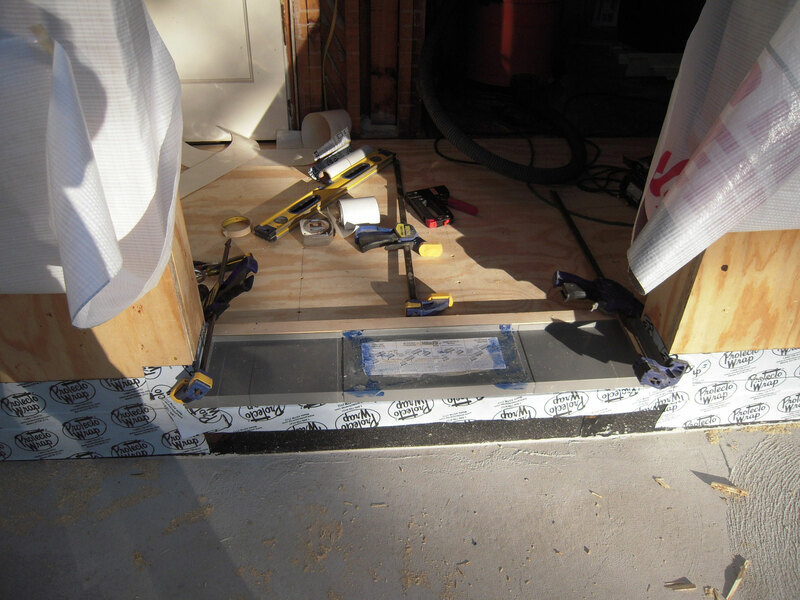 Now waterproofing is wrapped over the sill and a polycarbonate sill pan is placed to ensure that everything is protected. And the front door is popped into place. 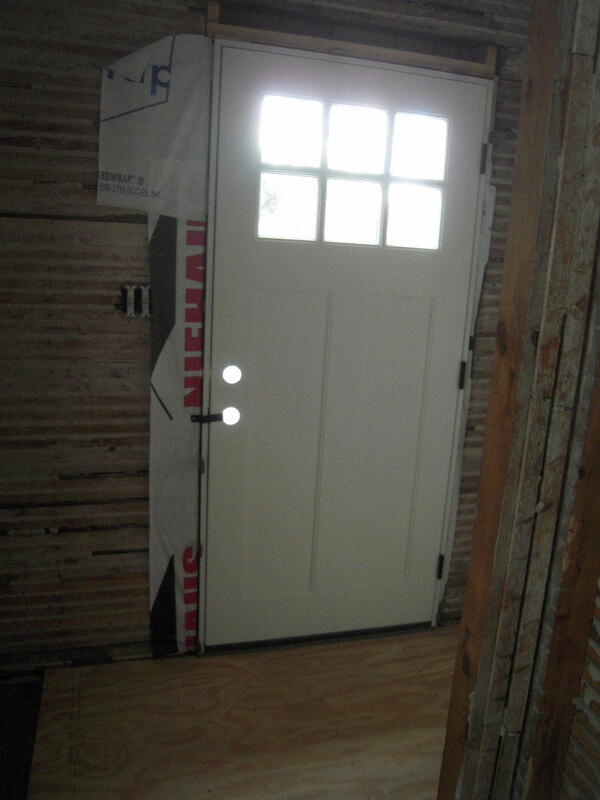 This is a Plaspro insulated fiberglass door. So finally maybe we can get back to that second floor closet? 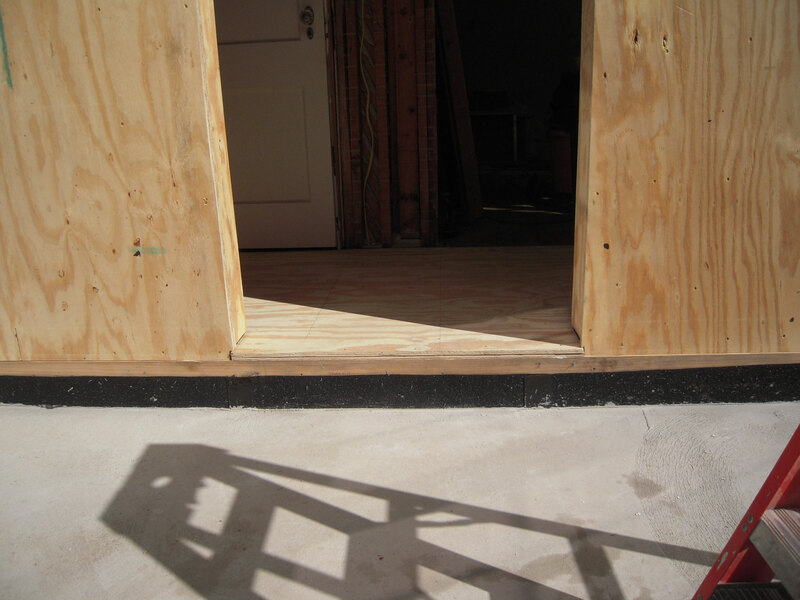 To refresh your memory – this is one of the front eave areas adjacent to the master closet. It was configured as a cold space. The insulated wall to the left was the interior bedroom wall. 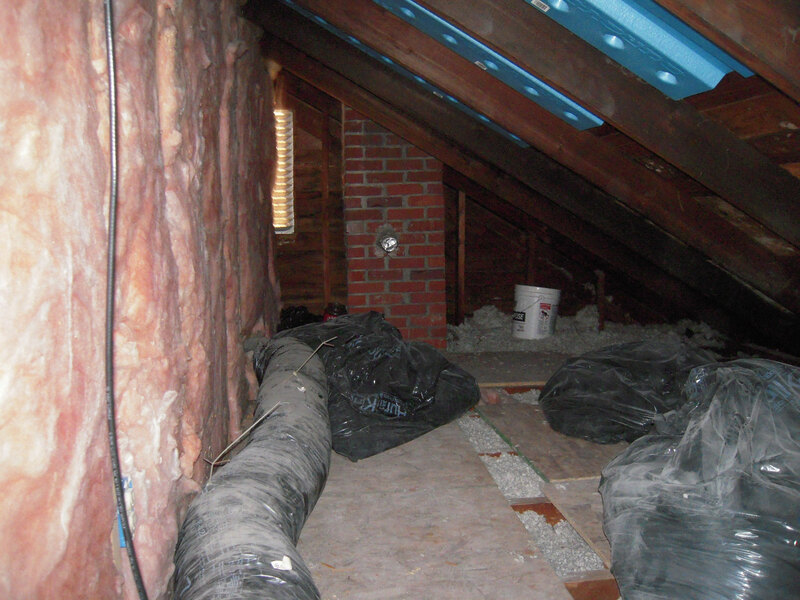 This area was open to ventilate the roof structure. You see the white bucket? 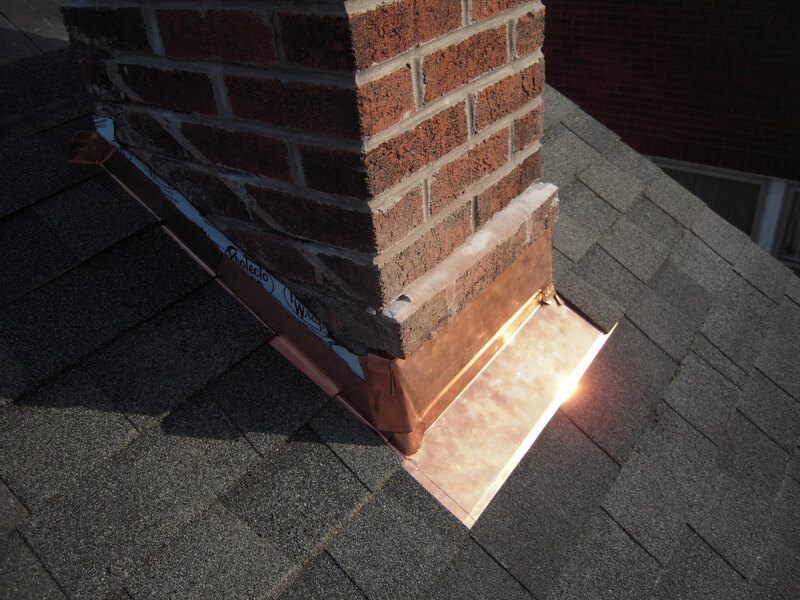 That was used because the roof was rotting from leakage around the chimney. Well, we gotta fix that. First we’ll address that little pipe with aluminum foil over it. Not sure what that was for, but we’ll lose the tin foil and fix it right. I cut out the bricks and installed some new ones and mortared them into place. This chimney will only be used for the direct vent fireplace, so it will have it’s own piping running through this space. It seems it’s hard for me to stay in the closet. So up on the roof we go and repair that rotting roof deck. I’ve replaced the decking with some pressure treated wood. Look at that fantastic flashing job! Could this be why the deck was rotted? 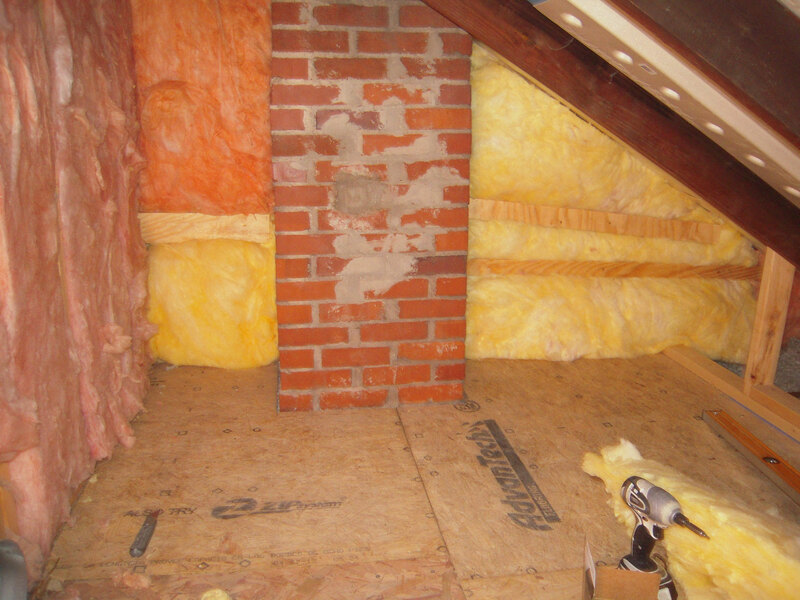 Hummm… When you install the decking around the chimney please leave a space between the wood and bricks. 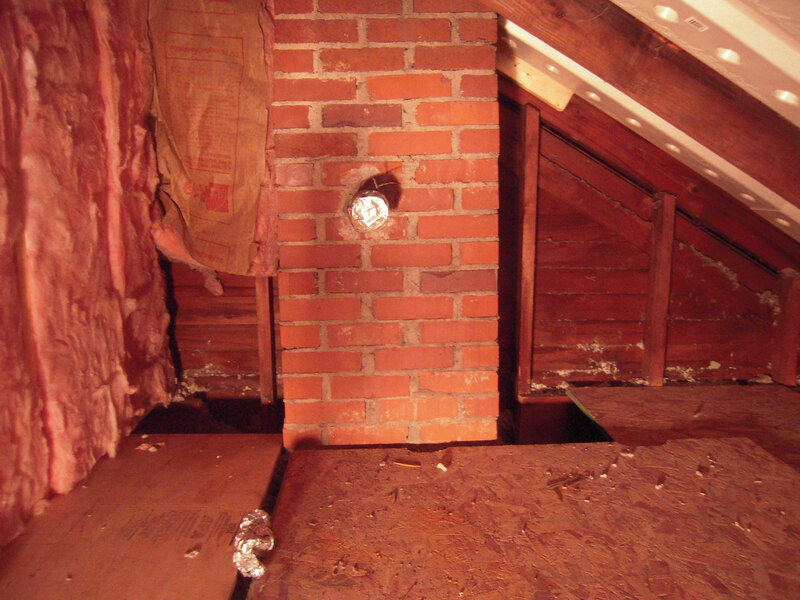 This allows expansion and contraction of the wood and possible rotting issues. 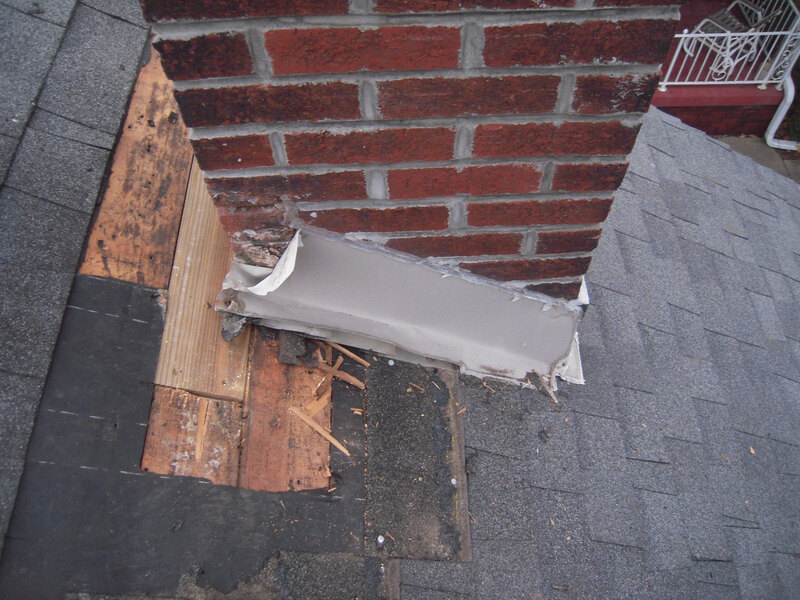 The flashing is what keeps the water out – not how tight the deck is to the bricks. 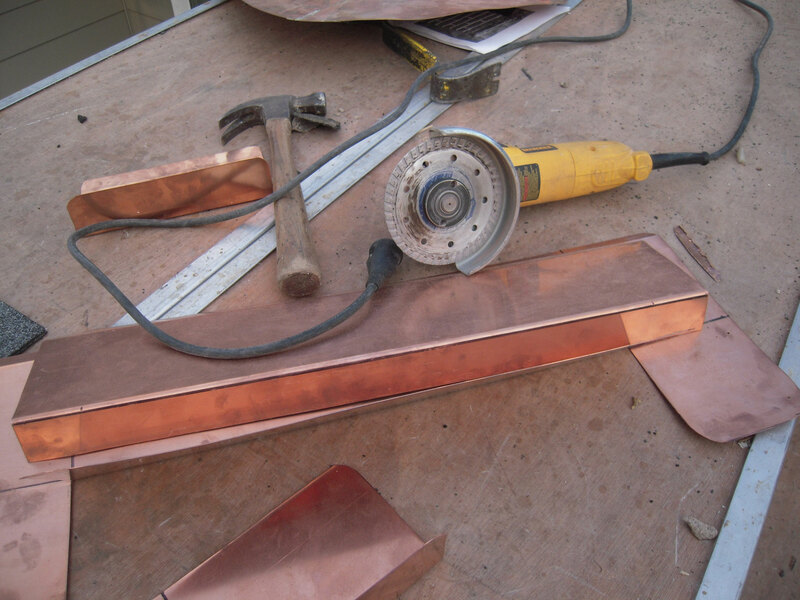 This place does beautiful work and if you follow the link you’ll see why copper flashing should be used. Here’s the part that’s called a cricket. 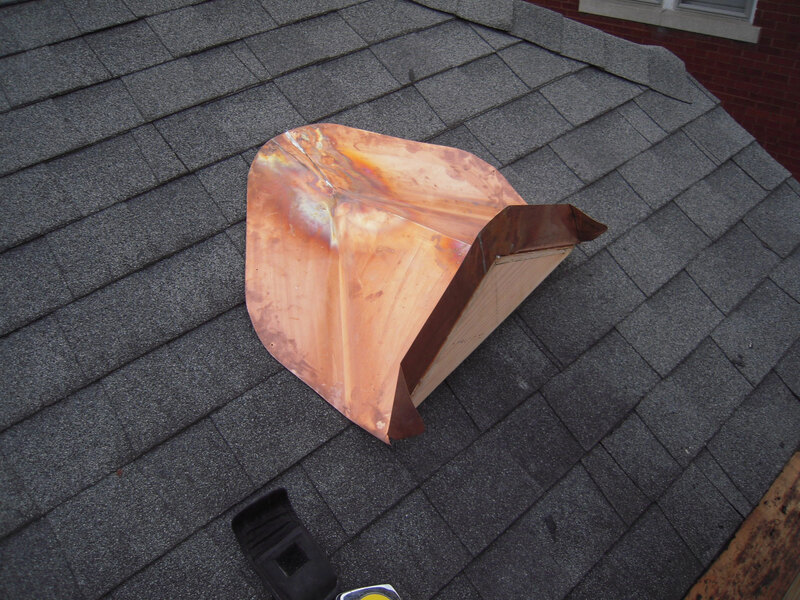 Because my chimney sits in the middle of the roof, it’s prone to all kinds of water issues – which is what caused my roof deck rot. Of course that entails some dusty cutting – with my converted circular saw that OSHA would not be too keen to see. 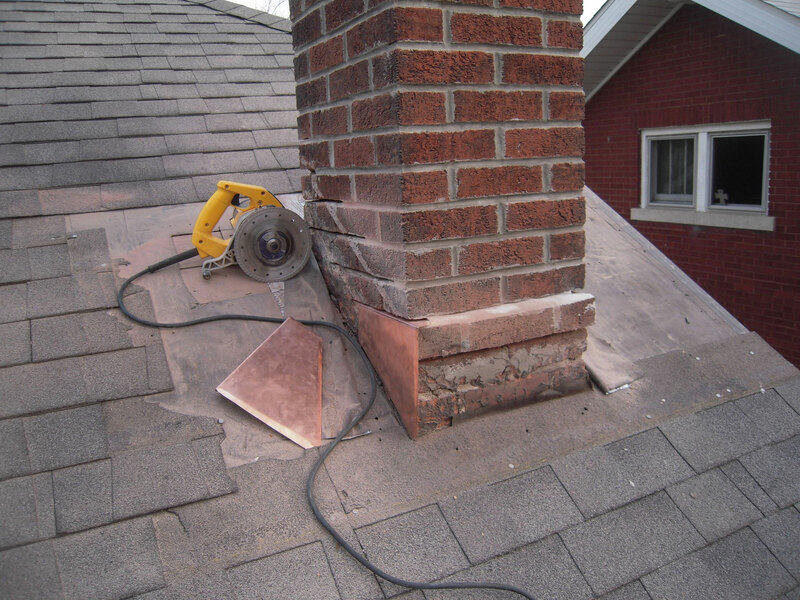 The diamond blade cut the mortar between the bricks easily. Here is the front pan and side roof flashing installed. 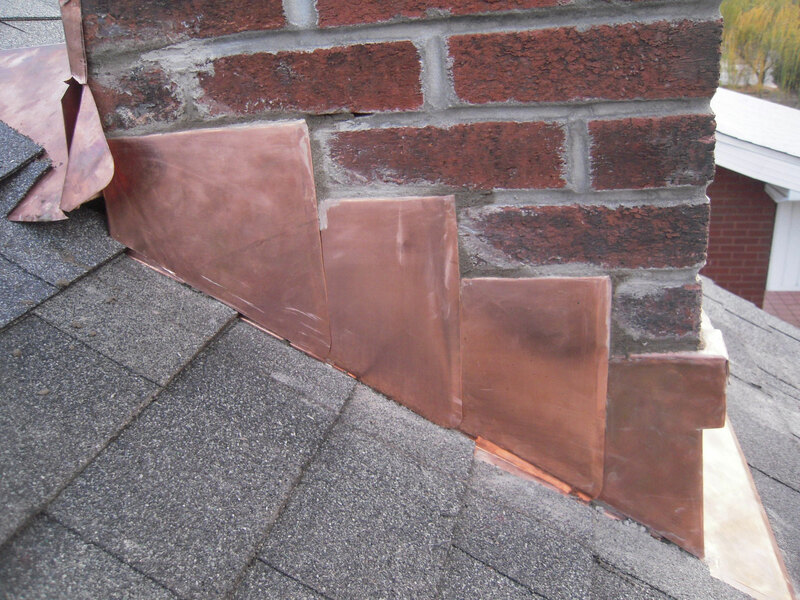 And here is the step flashing (The part under the shingles) and the counter flashing mortared into the brick joints. The kit didn’t fit perfectly, and needs some tweaking, mainly because it’s such an odd-shaped chimney. But it’s leak free and will let me get back to that closet project. All in all, it was a two afternoon project.